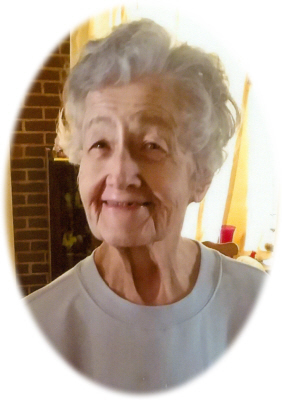 Marie Donalyn Baxter age 82, of St. Louis, MI, was called home by the Heavenly Father on Friday, November 2, 2018 at her home surrounded by her family. Funeral Services will be held at Smith Family Funeral Homes St. Louis, MI, on Tuesday, November 6, 2018 at 11:00 A.M., with Pastor Doug Strait officiating. Interment will take place at Chapel Garden Cemetery, Seville Township, MI. Visitation will be held on Monday, November 5, 2018 from 2-8 P.M. with family present from 2-4 & 6-8 P.M. at the funeral home. Marie was born in Alma, MI on October 7, 1936, the daughter of Harrison and Alice (Secord) Burnham. She grew up in St. Louis and graduated from St. Louis High School with the class of 1955. She met her future husband, Herbert Baxter at a Junior Extension Club Meet-up. They were married on June 18, 1955 at St. Louis United Methodist Church; Herbert passed away on April 21, 2008. She enjoyed spending time with her family, watching TCT, and reading the Bible. She is survived by 3 children: Darrel Baxter of St. Louis, MI; Dee Baxter of St. Louis, MI; Darlene (Hugh Wrath) Campbell of St. Louis, MI; 4 grandchildren: Benjamin and Jaime Baxter of Gobles, MI; Bridget and Andrew Olsen of Battle Creek, MI; Andrew and Amber Campbell of St. Louis, MI; and Amber Campbell of St. Louis, MI. She is also survived by her great grandchildren: Kayla, Hailey, Emily, Avery, Adriana, Alexander, Kenedi and Keegan, and her great great granddaughter Penelope. She was preceded in death by her parents, husband, twin brother Maynard Burnham, sister Janet (Burnham) Bell and brother in law Thomas Bell Sr. In lieu of flowers, memorials may be made to the wishes of the family. Online condolences can be sent to www.smithfamilyfuneralhomes.com. The family is being served by Smith Family Funeral Homes, St. Louis, MI.